So while it is the weekend of San Diego Comic-Con, and it should not be a complete surprise — without a word of warning hitting my feed — the trailer for the upcoming film, Ready Player One was released today. And wow it looks amazing. So, you have no idea what I am talking about and are wondering why Next Reality is spending our time writing about a movie instead of the Acer Windows Mixed Reality head-mounted display that showed up on my door today. Allow me to give you the run down on a mainstream film that could potentially be the very real catalyst for mass adoption of XR. Ready Player One is the New York Times best selling, first novel, by author Ernest Cline. The novel is being turned into a major motion picture, directed by none other than Steven Spielberg himself and financed by Warner Bros. The last 37 words should give you a tingle up your spine. If it did not, you likely do not know what Ready Player One is or you do not know who Ernest Cline is. Though Ready Player One is his first novel, previously in his writing career, Cline penned the script that became the film FanBoys. A pro-nerd road trip story about a group of friends trying to make their way to George Lucas's Skywalker Ranch. Their goal is not just going across the country to trespass on the property of the creator of the Star Wars franchise, though. Their noble purpose is to get their dying best friend and give him the chance to see Star Wars Episode 1 The Phantom Menace before his cancer takes him away. The movie is out in 6 months, he has been given 4 months to live. Watching as the guys end up in the city of Captain Kirk's birth and the Star Wars V Star Trek chaos that results from it, was a great time. If it is not obvious, the story in FanBoys is covered in thick layers of nostalgia and copious amounts of nerd humor, much like, though in a very different way, then Cline's 2011 effort, Ready Player One. The setting of Cline's novel is a near future dystopia. Energy Crisis, global warming, over population, and the further separating between the haves and have-nots, have our protagonist — Wade Watts — living in a place called The Stacks, which amounts to large stacks of mobile homes piled on top of each other. The primary point of escapism for the people, is a virtual environment called the OASIS. With a head-mounted display and haptic gloves, the people of this miserable time and place, live inside this virtual society. Using the OASIS they can go to school, they hang out with their friends and watch movies in virtual basements, and of course, they can go on adventures in this very gamified existence. One point that makes this story such a fun ride — so much so that I have taken my turn four or five times — is how Cline unapologetically leans and leans heavily on the pop culture of the 80's to carry out most of the action of the story. I can only imagine that Dan Harmon — creator and show runner of former NBC nerd hit Community, as well as Adult Swim's massive hit show Rick and Morty — either loves Ready Player One or feels like Cline has stepped on his feet thoroughly. 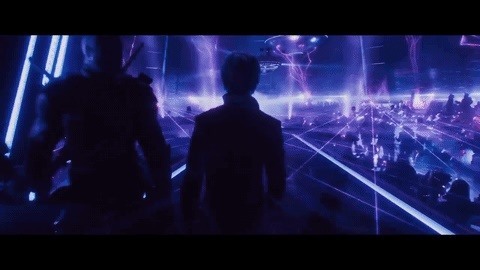 Image by Ready Player One/Warner Bros. If you want to know more about Ready Player One and cannot wait till spring of 2018, I highly recommend reading the book. If you are a fan of pop culture and nostalgia this an absolute must read. And the audiobook is even read by Wil Wheaton if that is more your style. You won't realize how ironic it is that Spielberg is directing the film until you have read the story. So How Does This Affect Us in the XR Community? I did mention the possible beginning of the disruption, which most anyone who would be reading this site is actively waiting and watching for. It's simple really, entertainment is, and has been throughout recent history, a direct influence in the design and creation processes of technology. A couple of examples that I over-use William Gibson's Neuromancer and Neil Stephenson's Snow Crash have had a massive influence in the tech sector. People have been trying to make the technologies that were imagined in those books for 25 or more years, to the degree that they are finally on the cusp of existence(minus the data jack in the back of the neck, or temple). Now, we have a major release coming, Warner Bros. financed, and directed by one of the greatest directors of our time — in terms of mainstream film — in terms of influencing the masses. The marketing budget will be astronomical. This movie is going to be a blockbuster for sure. How could it not be? And what does this future blockbuster feature? A world of people using immersive technology to escape the pain in their lives. A hero doing heroic things in immersive technology. Unlike the previously mentioned cyber-punk novels, this story is written for a younger group; an age group that can see a form of this fictitious technology existing in the real world today, an age group that does not have to leave this technology to the world of complete fantasy. It is also the group that will likely have the biggest influence in how the consumer forms of the tech work, outside of the manufacturers and developers themselves. With everyone understandably focused on enterprise solutions, I fear we will be handed a huge opportunity, and tunnel vision will blind us to the potential that comes with a massive marketing budget as well as the interest and curiosity that will be generated by that budget. Hardware and software developers, spring 2018 is not that far away. It is time to start scrambling toward those consumer, entertainment and education use-cases. I think I need to put my game developer hat back on and put my money where my mouth is. We are moving toward the potential to generate a level of consumer interest that will have them forgetting Pokémon GO like a bad YouTuber. And I hope we can capitalize on it. Oh, Hey! Microsoft! HoloLens - Minecraft - Windows Mixed Reality - Just putting it out there.